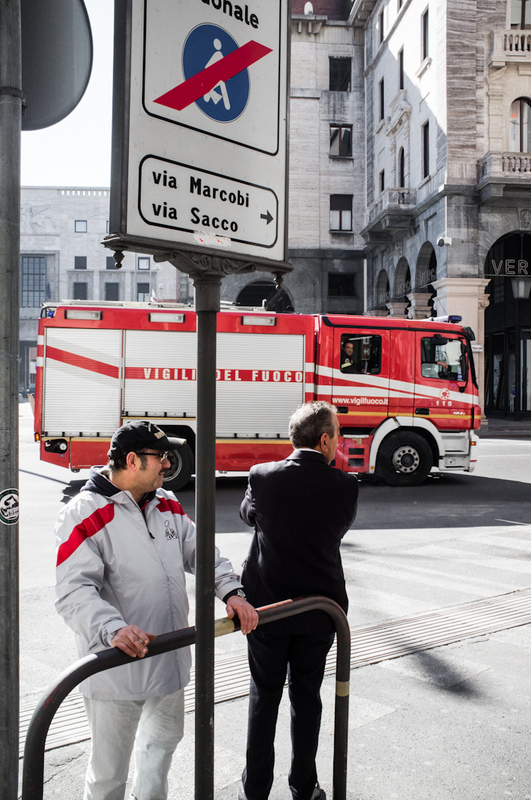 I saw the firefighter’s truck arriving on the place where i was standing and suddenly i noticed a possible juxtaposition: a man was in front of me with a jacket and a red stripe crossing it and on the top, a road sign with a man and another red stripe. So i waited a few seconds so that the truck could enter on my frame and i took the photo. When i came back at home and looked at this photo i could notice that the juxtaposition was definitely here, but something was missing. Composition is quite good because i managed to create a visual connection between the man and the truck. Light is good and even if the eye contact is missing it is not the main target fir this kind of photo. So what’s the problem? Simply, is not a beautiful photo and for me it’s the main problem with some juxtaposition: few of them are beautiful and they’re only successful if they’re really striking. This is not the case, the juxtaposition is not strong enough. Maybe without a title as “Red stripes” few people would notice them but, even if it’s not my best image, i think that we can take this photo as a good example of capturing the right moment even if it’s not so beautiful. It can be an important exercise for a street photographer to notice every detail not only in front of him but also surrounding him and trying to anticipate, ready to shoot. The details, even the smallest one are important so keep the eye well open because you can miss great opportunities. In the end, i have to consider this photo as a FAILURE even if it was a funny exercise.